As an entrepreneur, three of your favorite words are most likely “let’s DO this!” Advanced thinking and forward motion are where your comfort levels lie. While you’re busy running the show, you often need a boost from others to help you keep the momentum moving. To reach the next level is where our breakdown of Indiegogo vs. Kickstarter comes into play. By the power of the Internet and more importantly, the benefit of social media, we are in a time where we can propel our businesses and ideas not just among our friends and family, but through people who share our same passions. Indiegogo and Kickstarter are two of the most popular sites entrepreneurs use to raise money to fund their business. Both sites are user-friendly and house a variety of campaigns. Non-profits use the sites to raise money for their charitable cause. Independent films use it to raise monetary back for their projects and the list goes on and on. Before you reach out and begin “campaigning,” so to speak, make sure to perform your due diligence and research which fundraising method will work best for you. It seems simple enough to watch others become funded and think the same course will work for you. However, keep in mind that each campaign is unique with its own set of goals and measurements of achievement, which means that you will have different means of reaching success. At the end of the day when you’re creating a profile on either of these sites, you want to make your story stand out. That’s one thing that all successful campaigns on Indiegogo and Kickstarter have in common. So, then the question remains: how to decide between Indiegogo vs. Kickstarter? Indiegogo is not as well-known as its competitor, but it has its own appeal for entrepreneurs who want to jump start their business or launch a new product or invention. It’s free to set up a campaign. The site charges 5% on all funds raised, when your project begins to receive contributions. More variety on the types of projects able to be submitted for funding. Kickstarter typically accepts creative projects dealing with the arts, media, technology, and design. If your business doesn’t distinctly fall into one of these categories, Indiegogo may be your better option. Flexible funding means you get to keep every dollar you raise, even if you don’t reach your goal. Although you should plan for the best-case scenario of reaching your target, consider how you will allocate any money you receive if you do happen to come up short. Indiegogo is a lesser-known brand than Kickstarter and thus, may be harder to pick up traction or gain as large of an audience. History of success; over 95,000 projects have been funded since their launch in 2009. There is a built-in community with Kickstarter. For example, if you visit their website, it shows “new and noteworthy” Kickstarter campaigns for donors to review for consideration. Prior to official launch, you can test your campaign and receive feedback. Your chosen focus group can help you work out the kinks. They will make sure it’s polished before it goes live to the world. Unfortunately, if your project doesn’t reach its goal, no money is collected. Also, Kickstarter does not currently take PayPal payments; Indiegogo does. Any platform will have its pros and cons. No matter which fundraising site you decide to use, it’s still up to you to promote your project. While you may receive backers from people you’ve yet to meet, your first supporters will be friends, family, and peers. Prior to setting up your project, determine what kind of promotion you want to do and set out a strategic marketing plan. Keep in mind that when using social media, people can become fatigued if it feels like they’re just being sold to all the time. Brainstorm creative ways to share your story and make the actual act of donating appear secondary. If people confidently believe or support your idea it’s easier for them to want to contribute. Think about your goal and how feasible it is to achieve. Since most monetary goals are in the thousands of dollars, you have to think who you’ll outreach to for the bigger donations. If you are dependent on family and friends alone, it’s not likely that you’ll reach your goal on Kickstarter and therefore, will not receive any funds. Research your target audience to ensure that your campaign gets in front of the right eyes. Consider how you will spread the word. Will you set up an email campaign? How will you promote, through a special Facebook page? Will the people you are targeting be more comfortable donating through a site that is more well known to them, such as Kickstarter, or is that not a factor when it comes to the audience you plan to target? 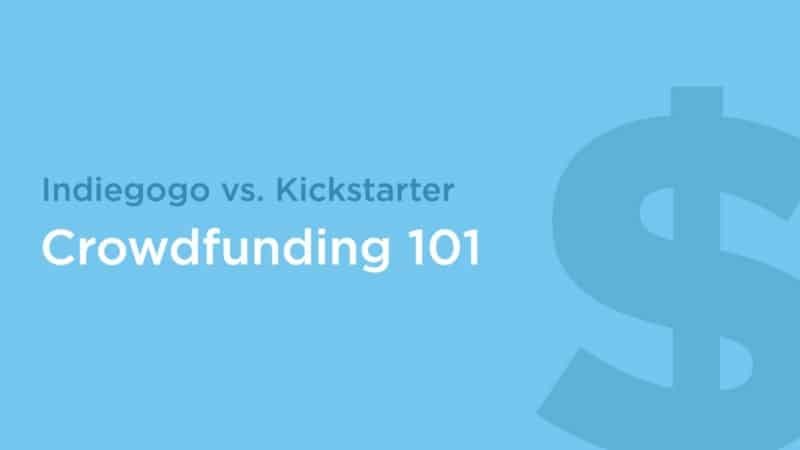 When it comes to deciding between Indiegogo vs Kickstarter, weigh your pros and cons and decide which one will fits your product, idea and campaign best. With careful planning and execution, you can launch a successful campaign and get the funding you need to take things to the next level.